CalCAN staff recently attended the Agriculture Sustainability Institute’s (ASI) annual field day at Russell Ranch. Founded in 1994, Russell Ranch is 300-acre facility adjacent to the UC Davis campus dedicated to research and education about agricultural systems in Mediterranean climates. On the Ranch is the Century Experiment, a 100-year study on the effect of varied agricultural management styles on a number of key outcomes spanning from soil health to economic viability and crop yield. This year marks the 25th year of the experiment, which has provided key insights into the benefits and trade-offs that are involved with implementing sustainability minded agricultural practices, including those that increase soil carbon and climate resiliency. The work of ASI and Russell Ranch is crucial in informing CalCAN’s policy efforts in Sacramento. Leaders from ASI and Russell Ranch, including soil scientist Kate Scow, ASI leaders Tom Tomich and Sonja Brodt as well as agroecologist Amélie Gaudin serve as science and technical advisors to CalCAN. 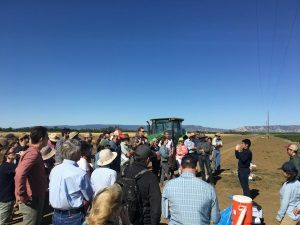 The field day was a unique opportunity for researchers to share developments in their work with those who might put these developments into practice in the industry. In attendance were farmers, Pest Control Advisors, Certified Crop Advisors, UC Davis students, non-profits, and Cooperative Extension Specialists, The focus of this year’s field day was “on relationships among water management, fertility management, soil health and soil biology.” Highlights included a look at the effects of dairy manure on soil health, research on a perennial grain called Kernza, and a deep dive into what researchers are doing to better understand the importance of microbiology in soils. The day began with a tour of the ranch where researchers were able to present their findings in the field. Russell Ranch’s new research manager, Nicole Tautges, gave an update on long term trends in data from the Century Experiment. Important findings include increased soil organic matter content and increased carbon sequestration in soils treated with winter cover crops, without a drop-off of in tomato yields. Additionally, studies at the Ranch have shown that organic agricultural management significantly increases soil life as measured by soil microbial biomass and respiration, and improves soil structure compared to conventional management. Researchers at Russell Ranch will continue to refine their experimental design to reflect trends in agriculture and scientific research, and are expanding efforts to quantify soil health. Assistant Cooperative Extension Specialist in Grain Cropping Systems Mark Lundy is working on research to better understand the potential of Kernza, a perennial cousin of annual wheat, to be a drought resistant and climate friendly grain alternative for California. While Kernza yields are currently much lower than other grains, the deep-rooted plant has the potential to reduce nitrate leaching, resist drought, and store carbon in the soil. The current experiment at Russell Ranch will help us better understand how Kernza effects soil microbial communities and soil carbon compared to wheat and how different rates of fertilization and irrigation effects these relationships. Sara Tiffany, Climate Smart Farming Program Specialist at CAFF, joined Rich Collins, owner of Collins Farm and Robert Payne, owner of Payne Farms, on a grower panel to discuss the challenge and potential of implementing sustainable agriculture on California’s farms. Both Collins and Payne highlighted the importance of soil health for their businesses and how issues such as water management were made easier with soil improvements. Panel members also commented on the financial challenges farmers face when starting to focus on their soils and discussed how programs such as CDFA’s Healthy Soils can help. While Payne appreciates the importance of research at Russell Ranch and other universities, he would be more likely to try something his neighbor tried than something a researcher tried. An important reminder of the importance of on-farm demonstrations projects, and the compounding benefits of grant funding through programs like Healthy Soils. If you would like more information about Russell Ranch and the Century Experiment, click here.